Many forces shape trade flows, including trade policies, changes in the nature and location of consumer demand, and differentials in the costs of labour and other inputs across geographies. Another important, but underappreciated, driver of trade flows is technology. The history of trade reflects the ongoing march of new technological innovations. After the Second Industrial Revolution, for example, the introduction of steamships and railroads changed the economics of trading across national borders. Likewise, the digital revolution of the 1990s and early 2000s enabled companies to interact with far-flung suppliers and customers (Baldwin 2016). Global value chains existed before the internet, but the internet further enabled fragmentation and offshoring of production by vastly improving coordination and communication costs. As China and other developing countries began participating in these production networks of specialised suppliers and assembly plants, trade flows soared and stretched around the world. The net impact of the entire wave of new technologies is unclear, but in plausible future scenarios they could dampen goods trade while further boosting flows of services and data. Evidence of technology increasing data and service trade has been found in previous research (e.g. Bughin and Lund 2017, Freund and Weinhold 2000), but the literature to date has not provided evidence at a detailed level of value chains. For companies and countries alike, these trends will benefit some companies, but will also create losers. A growing imperative for all is to focus on digital skills and infrastructure, service capabilities, and innovation. In this column we consider some of the possible effects and estimate the magnitude of potential change. Companies trading across borders often lose time and money to customs processing or delays in international shipments and payments. But a number of new technologies can ease these frictions. Digital platforms, for instance, connect buyers and sellers directly, lowering the costs of search and coordination (McAfee and Brynjolfsson 2017). They have created seamless global marketplaces in areas such as e-commerce, payments, travel, learning, and labour services – and there is room for much more growth. Alibaba’s AliResearch projects that cross-border B2C e-commerce sales alone will reach approximately $1 trillion by 2020. B2B e-commerce could be five or six times as that figure. 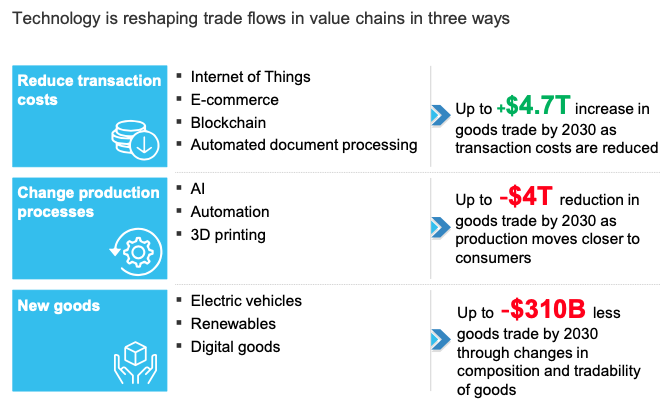 While some of those transactions may substitute for traditional offline trade flows, e-commerce could still spur some $1.3 trillion to $2.1 trillion in incremental trade by 2030, boosting trade in manufactured goods by 6–10%. This will include many small businesses that can directly reach customers in other countries. EBay, Alibaba, Amazon, Jumia and other online marketplaces are enabling the rise of ‘micro-multinationals’ – today, startups tap global talent, finance, and consumers from day one (McKinsey Global Institute 2016). Logistics technologies also continue to improve. The Internet of Things can track shipments in real time, while AI can route trucks based on current road conditions. Automated document processing can speed goods through customs. Some companies are developing fleets of self-driving trucks, and a number of ports worldwide have introduced automated cranes and guided vehicles that can unload, stack, and reload containers faster and with fewer errors. Blockchain has potential for tracking shipments and triggering faster automated payments, although it will be some time before its scalability and success in trade can be determined. We calculate that this group of technologies could reduce shipping and customs processing times by 16–28%. The academic literature finds that a 1% reduction in trade costs can result in a 0.4% increase in trade flows (Djankov et al. 2010, Hausman et al. 2013). Based on these figures, we estimate that these technologies together could potentially boost overall trade by 6–11% by 2030 compared to the baseline, worth some $4.7 trillion in annual trade. Looking at each country’s average processing times and bilateral flows, it appears that Bangladesh, India, and Indonesia are among the countries that could make the biggest gains. The diffusion of automation and artificial intelligence technologies suggests that multiple industries will experience a profound shift in the importance of capital versus labour (McKinsey Global Institute 2017). The growing adoption of automation and AI in manufacturing makes labour costs less important and other factors – such as proximity to consumer markets, access to resources, workforce skills, and infrastructure quality – more important. As a result, we can already see a trend towards moving production closer to end consumer markets, such as the US and the EU. Today, only 18% of goods trade is from a low-wage to a high-wage country, and that share is shrinking in the most labour-intensive industries, such as textiles and apparel. Both Adidas and Nike, for instance, have designed new lines of athletic shoes that make them amenable to full automation of the production process – and they have opened those new factories in Germany and the US (Adidas) and Mexico (Nike). In addition to affecting the trade in manufactured goods, automation will influence trade in services. Many call centre and help desk services are already ‘staffed’ by virtual agents, which are adding natural language processing abilities and beginning to handle a wider range of tasks. This is leading some companies to automate customer support and back-office services rather than offshoring them. This trend could reduce the $160 billion global market for business process outsourcing, now one of the most heavily traded service sectors. Additive manufacturing (3D printing) could also influence future trade flows. Most experts believe it will not replace mass production over the next decade; its cost, speed, and quality are still limitations. But it is gaining traction for prototypes, replacement parts, toys, shoes, and medical devices. Since 3D-printed goods can be produced near the point of use, they would eliminate the need for international shipping (although they may increase data flows as design files are transmitted). While this could reduce trade in some individual products substantially, the drop is unlikely to amount to more than a few percentage points across all manufactured goods by 2030. In some cases, additive manufacturing could even spur trade by enabling customisation. Overall, we estimate that automation, AI, and additive manufacturing could collectively reduce global goods trade by up to 10% by 2030, as compared to the baseline, or $4 trillion in annual trade flows. However, this reflects only the direct impact of these technologies on enabling production closer to end consumers in advanced economies. It is also possible that these technologies could lead to nearshoring and regionalisation of trade instead of reshoring in advanced economies, impacting both modes of transportation (e.g. overland and air cargo replacing container shipping) and trade corridors. We already see that intra-regional trade has grown faster than inter-regional trade since 2013, a trend seen worldwide but particularly notable as regional value chains are developed in Asia and in the EU28 (McKinsey Global Institute 2019). As technology transforms some products and services, it will also alter the content and volume of trade flows. Some of these may have unexpected consequences for trade flows. Renewable forms of energy, such as solar and wind, are less tradable than carbon-based fuels such as coal and LNG. The ongoing decarbonisation of economies and shift to renewable energy may therefore reduce trade in energy. As another example of indirect impacts on trade, growing adoption of electric vehicles could reduce trade in auto parts. McKinsey estimates that electric vehicles will make up some 17% of total car sales globally by 2030 (up from 1% in 2017), but as their drivetrains have only about 15% as many moving parts as internal combustion engines, this trend could reduce the hundreds of billions of annual trade in vehicle parts by up to 10% while also dampening oil imports (over half of which are used in transportation). The shift from physical to digital flows that started years ago with individual movies, albums, and games is now evolving once again as companies such as Netflix, Tencent Video, and Spotify popularise streaming and subscription models. Streaming now accounts for nearly 40% of global recorded music revenues. Cloud computing uses a similar pay-as-you-go or subscription model for storage and software, freeing users from making heavy capital investments in their own IT infrastructure. The shift from physical goods to streaming, leasing, and pay-as-you go services is only in its infancy. This will affect not only the composition of trade – from physical goods to services – but likely also the relative value of services. The net impact of these countervailing forces on global trade flows is uncertain. But in plausible scenarios, it is quite possible that the next impact could be to further accelerate the shift in global trade flows from goods to services. This is consistent with other research on the causes of the slowdown in trade (Timmer et al. 2016). Already today, services trade is growing 60% faster than goods trade overall. Some types of services, such as IT services, telecom, business services, and IP royalties, are growing 2-3 times as fast as goods trade. Moreover, 30% of the value of traded goods comes from the embedded services in their production, such as engineering and design, financial services, distribution, and marketing (Miroudot and Cadestin 2017). Counted in value-added terms, services already account for at least 45% of global trade flows. 5G wireless networks, virtual reality, and augmented reality may all give a boost to services in the future. The advent of ultra-fast 5G wireless networks opens new possibilities for delivering services globally. Remote surgery, for example, may become more viable as networks transmit sharp images without any delays and robots respond more precisely to remote manipulation. In industrial plants, 5G can support augmented and virtual reality-based maintenance from remote locations, creating new service and data flows. Despite the increased trade tensions, rise of nationalism, and well-documented slowdown in global goods trade, globalisation is not in retreat (Lund and Tyson 2018). Rather it is entering a new chapter that is being driven by the flows of information and data, as well as technological changes reshaping industry value chains.